Team Suzuki Press Office – April 7. 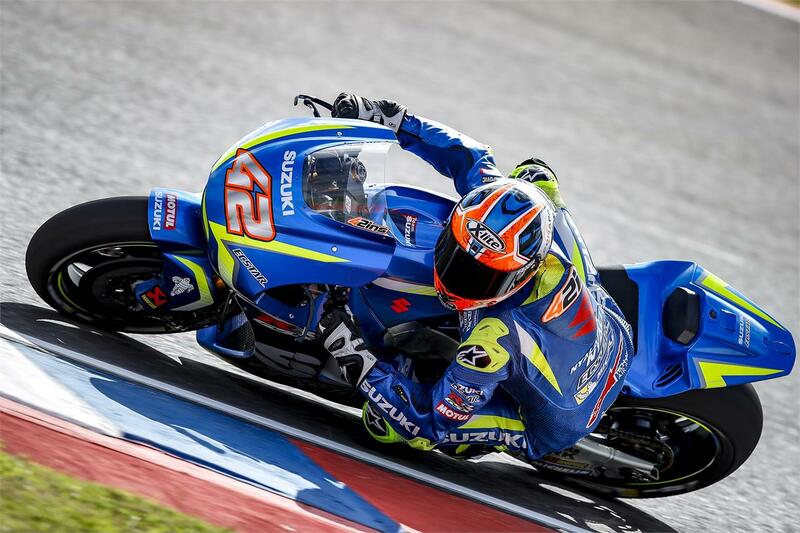 Team SUZUKI ECSTAR’s Andrea Iannone got his first taste of the Termas de Rio Hondo circuit on the first day of practice of the Argentinean GP with Italian classifying 10th with a best-lap 1’40.250, in a hard-fought session while Alex Rins struggled with the pain in his ankle, but managed to make solid progress during the day, closing today´s session in 20th place. Today’s sessions proved to be very fast compared to last year; pretty much all riders improved on their lap time by two seconds, which suggests that the track is in better condition. Iannone, as well, was able to shave nearly two seconds off last year’s best for Suzuki and the GSX-RR. He further-improved on his times substantially from the morning to the afternoon (1'40.701 his best in FP1). His 10th position in the provisional classification is also good news for tomorrow as if rain falls, as expected, he has likely already done enough to secure direct access to Q2. It was a positive day for Rins, considering his physical condition. He decided to start the first session without any painkillers or support on his ankle to better understand his present condition.